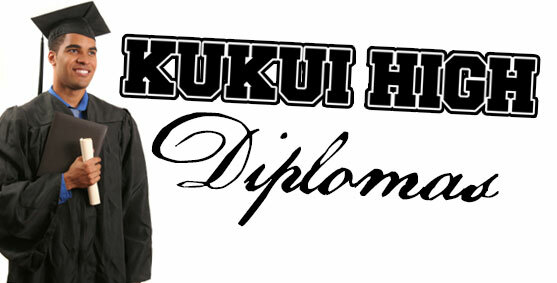 Kukui High School alumni can now order certified copies of their KHS diploma! 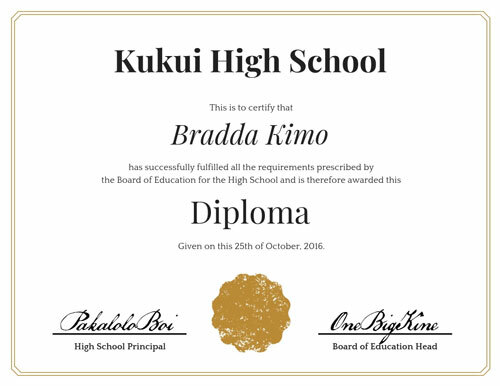 In order to assist our graduates in documenting and declaring their successful matriculation, Kukui High School is now allowing alumni to order official KHS diplomas. * These diplomas are custom made, laser printed on 24-pound parchment paper, featuring a gold foil embossed Kukui High School seal, and presented in a striking and sturdy red presentation cover. Suitable for framing, each diploma is hand-signed by Kukui High founders. KHS diplomas are $35 each, plus tax and shipping. We’re committing $5 from each sale towards a good cause as soon as we’re open for business. Be sure to check back soon for updates. * Kukui High School diplomas are not official Hawaii state documents and include a disclaimer to that effect.